Storage reports can be created on a regular schedule, or as required once off on the fly. 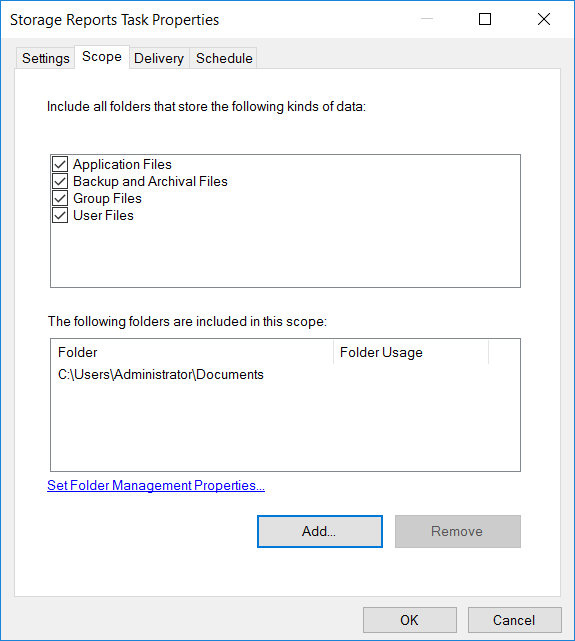 From Server Manager, select Tools > File Server Resource Manager and then select Storage Reports Management as shown below. 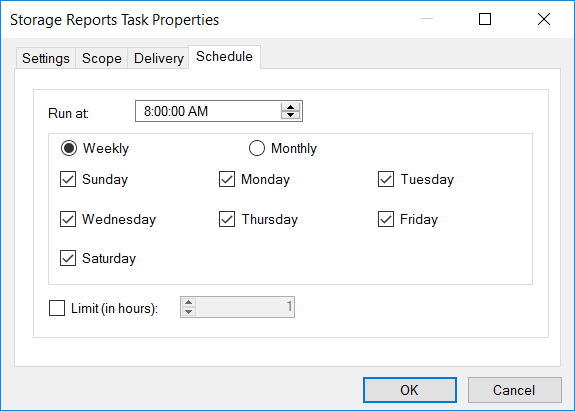 To create a scheduled report, select Schedule a New Report. 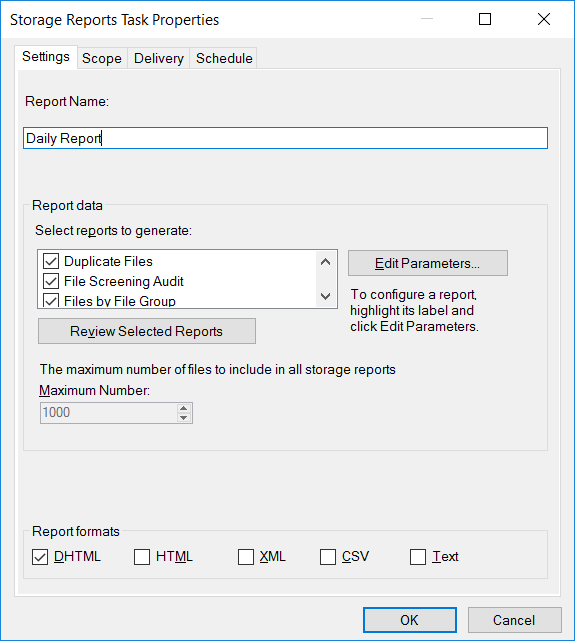 The Storage Reports Task Properties window will open on the settings tab, as shown below. 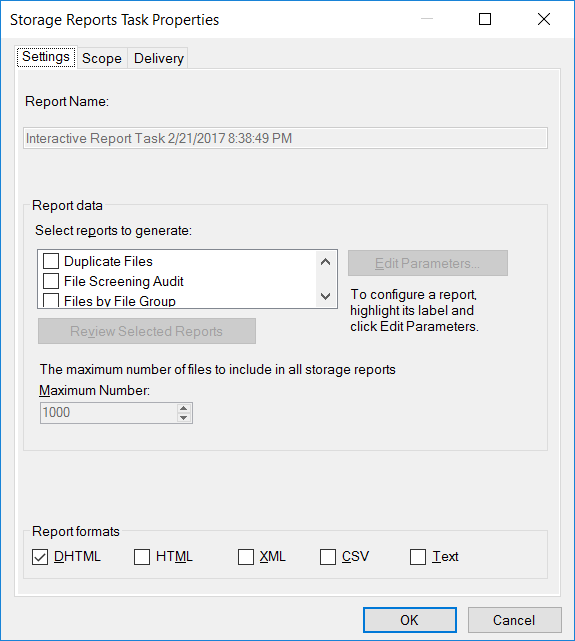 We can give our report a name and then select the reports that we wish to generate. By default most of the available reports are ticked and will be generated. You can highlight any of the reports and edit the parameters of the report. Towards the bottom we can select the formats that the report should generate from DHTML, HTML, XML, CSV, or Text. Next on the scope tab we can define the folders that we want to report on. We can select some built in options toward the top, and specify our own custom folders to be in scope toward the bottom. The delivery tab allows us to send the reports out via email to a specified address or semicolon separated addresses list. 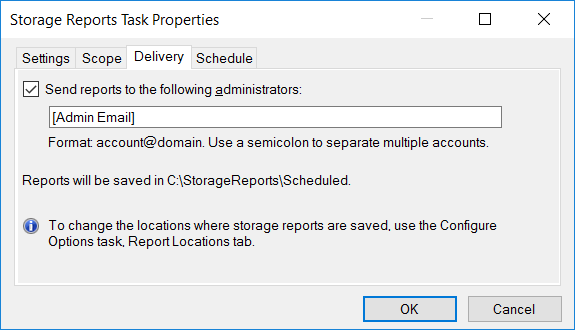 Reports are also saved in the C:\StorageReports\Scheduled folder on the FSRM system. Finally the schedule tab is used to specify when you want the selected reports to generate. In this example we are creating a daily report that will run every day of the week at 8am. You can now click the Ok button to create the scheduled report. We can now see it listed under Storage Reports Management. Creating a once off report is essentially the same as a scheduled report, the only difference is that you select Generate Reports Now. 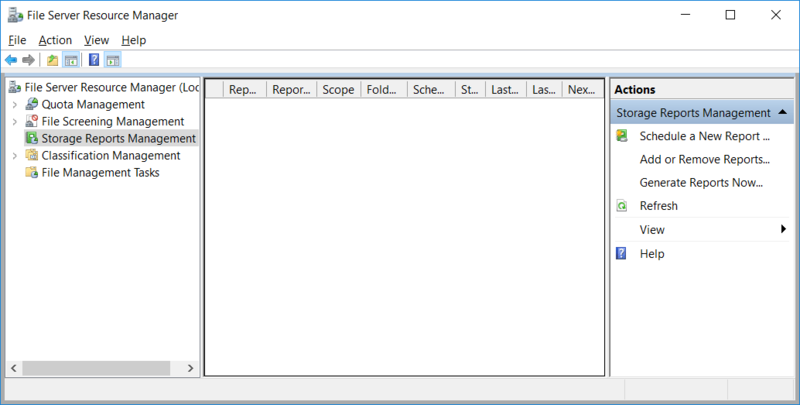 The window that this opens is mostly the same as creating a schedule report, with the exception that there is no tab for defining a schedule as this is a once off report. Scheduled reports can be selected and run any time outside of their schedule, so if you already have a scheduled report that you want to generate you can generate it at any time and don’t need to manually recreate it by using generate reports now. We can configure storage reports with File Server Resource Manager (FSRM) in Windows Server 2016 to email and store various reports related to the status of content present in the file shares on the file server. We can schedule reports to be automatically generated at specific times, or create one off reports as needed on a case by case basis.